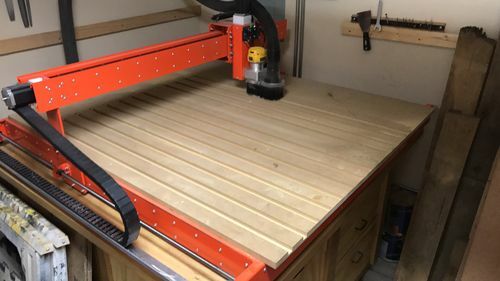 This is the third CNC that I have had in my shop and is a review of the Garageworx CNC but based off not only the experiences I’ve had with the other two machines but also against my expectations of what I need a CNC to do in my shop. If you’d like to read the article I wrote about me previous CNC journey you can HERE. The GarageworX CNC is similar in some regards to other CNC kits on the market today because the owner assembles the machine and with that some of the quality and performance of the machine is depended on the attention to detail. A big thing that sets the machine apart from most DIY CNC Kits on the market today is that it is constructed of steel and not aluminum. The linear drive mechanism is another area where the GarageworX excels over other CNC machines since it uses acme threaded rods with anit backlash lead nuts …. oh and powder coated a beautiful safety orange. 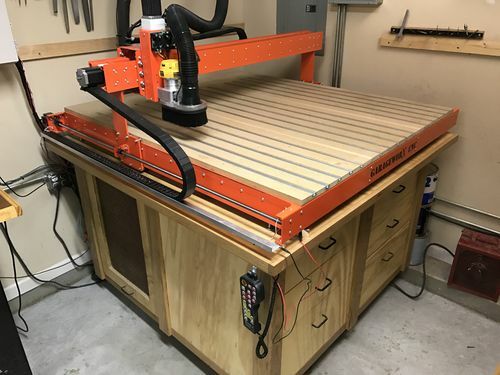 Dave Gatton sells the GarageworX CNC in three different sizes (24” x 18”, 36” x 24”, and 48” x 48”) over at www.garageworxcnc.com. The CNC DIY kits are available as “a rolling chassis” which includes all the metal components, hardware, and V-groove bearings listed as Package “A”. 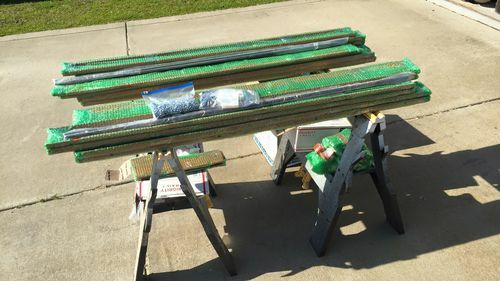 This makes it easy for you to add your own acme precision lead screws, acme nuts, and couplers or if you prefer order Package “B” and get your lead screws already cut to the correct length with the acme nuts, couplers AND the bearings and bearing mounts. Dave also recommends the stepper motors and drive box that he uses and has a link to their website but you have the option of also getting them from another retailer. All the other options are completely up to you to customize to your needs. 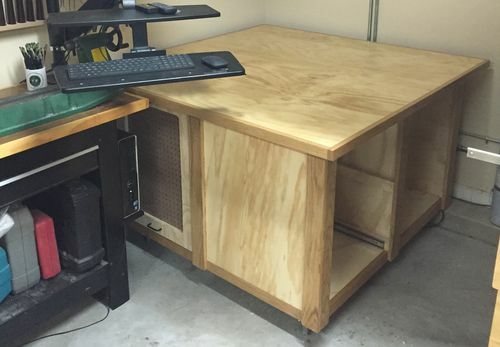 This is truly a DIY CNC kit because you can pretty much customize it exactly how you want. For example the hole pattern on the Z axis for the spindle mount is a standard configuration so you can either purchase a mount to fit whatever spindle or router you plan on using or make your own. Later I will discuss some of the “options” I added to my GarageworX CNC. Of course the first thing needed before assembling the machine is to have a flat and steady base for it. 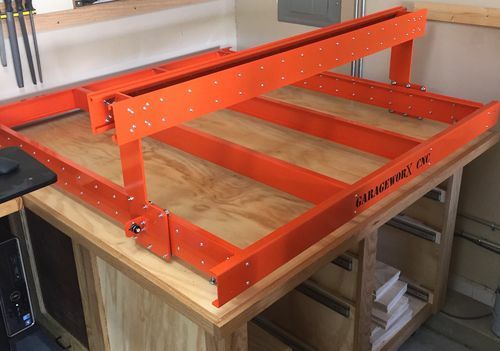 To fit the GarageworX 4×4 CNC I had to build my base for it 56” x 56”. The GarageworX CNC is packaged very well for shipping and normally arrives crated up. To save a little money on shipping I drove down to Atlanta, GA and met up with Dave Gatton to get mine and the GarageworX CNC that was going to the Falcon Children’s Home. Assembly of the “rolling chassis” is pretty straight forward. I found that while assembling the frame it was almost self squaring due to the way it was designed. Some of the threaded holes did have to be cleaned out a little due to some powder coating on the threads. Once assembled and wired I began adding the extra accessories that I wanted to include the spindle, spindle mount, 2.8w Laser for engraving, Dust Shoe, relay to control the spindle and dust collection, touch plate for zeroing the Z axis, limit/homing switches, t-tracks, drag chain for wire management. I have been using the machine for about a year now and I am very impressed by its performance and accuracy. A good example of this was when I used the GarageworX CNC to cut the pockets on the wasteboard for the T-Tracks. It was a perfect fit! Drive box and Stepper Motors – 4 Axis 45V 4.0A Drive Box with Four 4.0A 425 oz.in. Stepper motors. So what was the overall cost of the machine with router and all the options? I think with all the bells, whistles, and laser I am about at $3500.00! Not to shabby for a solid CNC Router with Laser Engraver. Great review, still trying to decide. Informative review Mike – thanks for taking the time. I’ve had the XCarve 500mm for a bit less than a year and have been happy with it – know that I’ll be looking for upgrade options soon. Didn’t know about the GarageworX until reading your review. What software are you using? V-carve pro? John I was using V-Carve Pro for awhile but have since upgraded to Aspire. I have a 4×4 garageworx and love it. Need to get a metal router mount, I’ve been using the wood one from my Gatton CNC that I upgraded from. I see your using one from CNC parts so that answered one of my questions already. The other is do you have plans for your base? I’ve got mine on a table and plan on rebuilding it soon to something more stable. Great review btw.